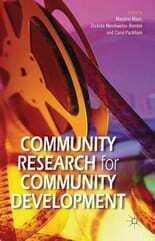 This book focuses upon the contributions that research can make towards strengthening community development and working for social justice agendas in Britain. Drawing upon original research, as part of the Third Sector Research Capacity Building Cluster, the volume explores different ways in which research can contribute to capacity building and ‘research mindedness’ in the Third Sector. This includes the contributions that community-university research partnerships can make, enabling organisations and social movements to undertake research for themselves. Examples include research with refugee and asylum seeker organisations and groups, research with faith-based organisations and research exploring the relevance of community arts, media and sports. Whilst the book covers a number of related themes, they share an overall focus upon community development to promote active citizenship and social justice.